2012 was not a good year for concentrated photovoltaic (CPV) solar firms. GreenVolts went under and Amonix went quiet after shuttering its Nevada factory and laying off much of its staff. Brad Mattson, CEO of Solexant and semiconductor entrepreneur, spoke at PARC recently and suggested that CPV technology might succeed in the shape of a more vertically integrated corporate structure. He gave the example of Semprius, a system supplier, combining with Solar Junction, a compound semiconductor startup. Mattson got it kind of right. Solar Junction just signed a co-development agreement with Amonix, the CPV systems developer. Both companies can lay claim to recent and accelerating efficiency records in their respective technologies. But both companies have also been battered by the failure of CPV to fully compete with flat-panel PV in a ruthless solar market. This Amonix-Solar Junction announcement looks to be coming out about five years too late, given the painful decline of Amonix and the fierce learning curve of c-Si. In October 2012, VC-funded Solar Junction hit an NREL-verified 44 percent cell efficiency (at 947 suns), an improvement over the previous record, also set by Solar Junction with 43.5 percent (at 418 suns). Amonix won the world record for a CPV module in 2012 with a 33.5 percent conversion efficiency. Vijit Sabnis, a Solar Junction co-founder, said, "The joint development agreement between Amonix and Solar Junction will enable the two technical teams to work very closely together to develop a low-cost CPV module with DC efficiencies exceeding 35 percent in the near term and a goal of 40 percent in the next couple of years. Think of Apple designing an optimal piece of electronics all in house vs. the Wintel traditional OEM model; the latter never really works as well as we’d all like." Sabnis adds, "CPV has a tremendous amount of headroom for improvements in performance and cost; bringing the two teams together will help accelerate the development and deployment of next-generation CPV systems that significantly beat the cost of 1-axis tracked Si in sunny climates. 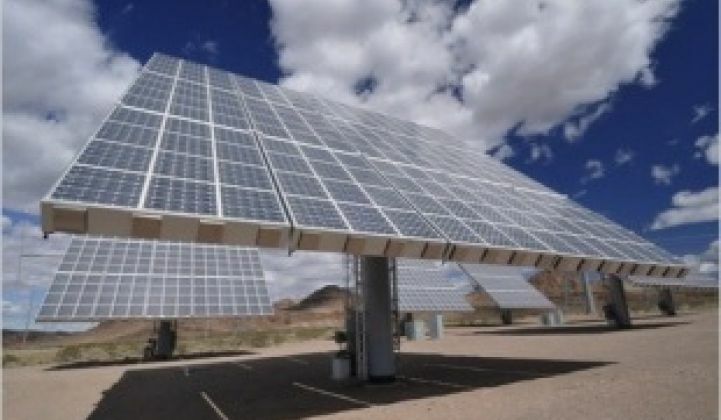 The goal is to accelerate the gains in CPV cost/performance metrics to create a viable market even in the face of Si module prices crashing through the $0.40 per watt barrier in the next few years." A colleague and early employee at a rival CPV firm notes, "The CPV industry remains locked in a battle against declining costs with silicon technologies. The 2012 surge in cost reduction achieved by silicon may ultimately prove to be the death blow to today's commercial CPV providers, though there continue to be innovations in CPV cell efficiency and module design that could keep the technology alive in the highest DNI environments. The big question is whether silicon will allow some breathing room in 2013 with the price increases that some predict, or whether further cost and price reductions in 2013 make the gap wholly uncrossable."